was involved with the final alignment of the Independent School District boundaries in the area. obtained an Orderly Annexation Order from the Minnesota Municipal Board as to municipal corporate boundaries in the area. practiced family law, personal injury law, business and corporate law, and agriculture law in addition to his present concentrations of estate planning, elder law, probate and trust administration and real estate. represented Ridgeview Medical Center for many years, as well as the City of Waconia and several other municipalities in the area. Growing up as a pastor’s son, Paul’s values have always guided his interactions with others and set a tone of integrity for Melchert Hubert Sjodin. Paul has sought talented and well-rounded attorneys who do the best possible job for their clients, their families and their community. He has modeled a culture of structured professionalism, competence and fairness at the growing law firm. Paul has a deep seated desire to help people in general and his clients in particular. He uses his problem-solving skills and community focus to build upon a third generation of clients at the law firm. He finds very few things more rewarding than helping a family take over the ownership and operation of a multi-generation family Century farm. Two of his three sons – all attorneys – also work as attorneys at the law firm. Paul prides himself on providing excellent, professional, knowledgeable and honest services. He can always look his clients in the eye and know that he did his best to do right by them. 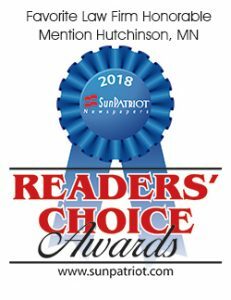 Paul has an AV® Peer Review Rating in the distinguished legal directory, Martindale-Hubbell®* and was named “Minnesota Lawyer Attorney of the Year” for Outstanding Service to the Profession in 2009. He has served on the Board of Governors of the Minnesota State Bar Association and has always worked toward the advancement of the legal profession and its obligation to serve society in the best way possible. A retired Colonel in the Army Reserve and Minnesota Army National Guard, and a family man (he has five children and ten grandchildren), Paul is dedicated to his church, his country, and the community in which he lives. Over the years he has been deeply involved with the Waconia Chamber of Commerce, Waconia Lions, Waconia and Mayer Lutheran High Schools, the American Red Cross, Boy Scouts of America, and other community organizations. He is a past President of the Carver County Historical Society, and as President of the Waconia Heritage Association since 1983, he has helped complete and publish the two books as to the history of “Waconia: Paradise of the Northwest.” Paul has received community service awards from the Lions, Rotary, Eighth District Bar Association, and Waconia High School. “We believe, and sincerely trust that, we have a tradition of excellence and visibility in our community and that we are thought of as good people as well as good attorneys,” he says.